I know I’m practically the only one, but I do. I love that it’s super vague, and I don’t like the move away from it in newer editions of D&D (though I don’t like the notion of tacking it on to games that don’t have it). I know that it’s an unnecessary piece of the system that’s carried forward for the same reason that fireballs always do 1d6/level damage, and I still like it because it’s an occasionally convenient piece. Since the dawning days of Advanced Dungeons & Dragons, there have been nine alignments, moral and ethical positions that characters and deities adopt. Some creatures, like demons or angels, are committed to an alignment as a fundamental part of their nature. 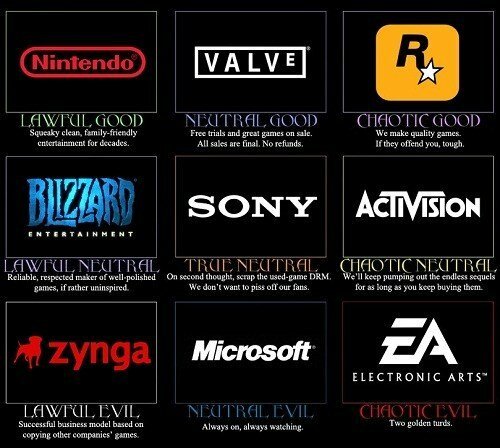 All characters have an ethical alignment (Lawful, Neutral, or Chaotic) and a moral alignment (Good, Neutral, and Evil), resulting in a two word combination that has some kind of meaning (yes, neutral neutral is an alignment). 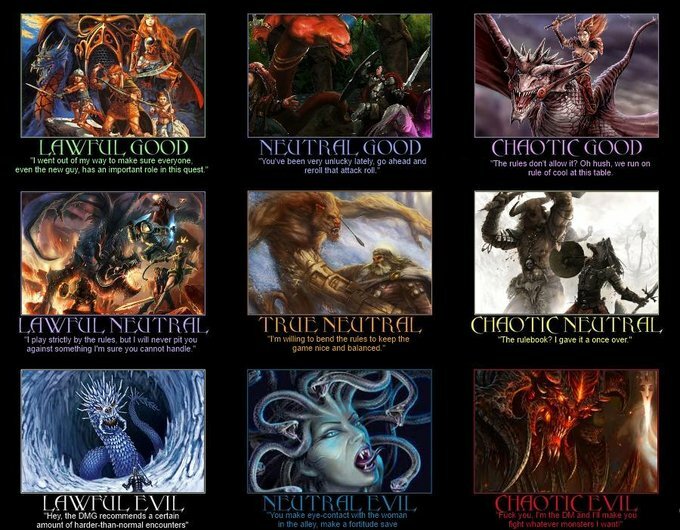 Since D&D isn’t written by philosophers or ethicists, what it actually means for someone to be committed to any one of these alignments tends to vary wildly. If you think this is a cause for a lot of arguments, especially since certain alignments are required for certain powers, you’re absolutely right. The biggest complaint about alignments is probably that they’re vague. They don’t give a lot of guidance, and they’re not really well thought out when it comes to what behaviours and motivations are consistent with what alignment. They don’t confront any strong moral questions, and they’re generally so watered down that it doesn’t mean much of anything to be a follower of them. Someone who’s lawful neutral might value law as in the law of the land, or the law of their religion, or some natural law, their own personal code of honour, or the abstract principle of law itself. The result is that even people of the same alignment probably don’t agree on very much. There have been moves to link alignments to various philosophical ethical systems, but this doesn’t really work. for one, it makes alignments less useful, requiring players not only to understand their characters but also to understand the nuances of an ethical system they’re unfamiliar with. For another, as someone who has a graduate degree in philosophy specializing in ethics, the version of these ethical systems that show up are usually so rough and muddy that they do a disservice to the system itself. Virtue ethics is about more than being your idol, and consequentialism is about more than weighing consequences. This method creates more work for players, and doesn’t actually make the alignment system more rigorous or interesting, though it does create a more rigorous system whereby players can tell each other they’re doing it wrong. What I like about alignment is that it’s more than values. It binds a character’s values together in a way that describes their outlook on the world.It’s muddy as hell, but life is murky and weird. People who value many of the same things to the same degrees often still have very different perspectives on the right way to act. their experience is going to colour how they act on their values, who they trust, and how far they’re willing to go. But the nine alignments provide a nice array for characters to slot themselves into generally, and can provide a descriptive account of where they sit relative to everyone else without needing to dig into sophisticated ethical systems unless the player wants to. At my table we use alignment as a tool for self-reflection. I have a talk with each player when they choose their alignment, and we talk about what that alignment means and what their character’s values are. 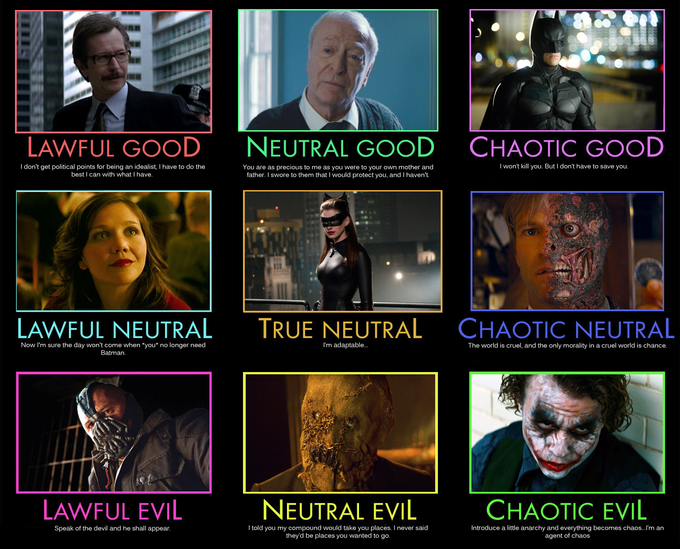 As the campaign goes on, I monitor their character’s behaviour, and we use that alignment discussion as a check. Things always shake themselves out in play, and maybe that lawful good hero is really more chaotic good. I check in with players as needed and talk about how their behaviour is shifting based on the early conversation we had, and I usually suggest a new alignment. At that point we decide whether they want to try to stick closer to their original, or try out the new one. Alignment shouldn’t be restrictive, it should create opportunities for growth. In characters like paladins, alignment is restrictive because the player consents to those restrictions. In this way, it’s a check that always does what the player needs it to do. If someone is less than concerned about their alignment, then they pick up their new alignment and go on their merry way. If the outlook of their old alignment is really important to them and their concept, they work harder to stick with it. Either way, there’s no pressure and no sense that they’re playing their character wrong, just that the character is changing over time. 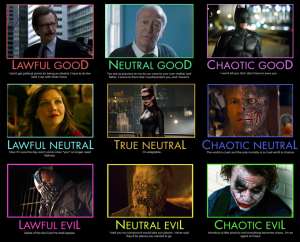 One of the things I love about alignments is that it lets us have conversations about good and evil. I enjoy the idea of evil being this tangible thing that people understand. Evil gods aren’t just deities of different outlooks, some of them are elementally diabolical, which makes acts of heroism shine that much brighter. With evil, there’s no quibbling. Demons might be nice and civil, but they’re also evil. When it comes down to it they’re looking out for themselves, not you. They relish inflicting pain because evil, and for no more complicated reason. There’s a wonderful simplicity to that that often intrigues and terrifies players when they dig into it. they’re not evil because of reasons, but because of their nature, and make no apologies for it. Good creatures are more complex, because there’s an interesting open question about whether a character can be good by their nature and the distinction between being good and doing the right thing. Alignment lets us cash out these concepts in clear ways in part so we don’t have to spend hours talking about ethics and can get right down to the feels of good and evil. So I like alignment. It’s a useful tool for self-reflection, often has (occasionally asinine) consequences for in-game moral choices, and compartmentalizes the world in a way that simplifies some things and complicates others. It’s useful when it’s useful, and the rest of the time, who cares? It’s not a tool for telling people they’re doing it wrong, it doesn’t demand complex ethical understanding, and it can accommodate people who want to think more deeply about their character’s ethical position while not alienating people who want to kill monsters and take their pants. I like alignment but I don’t use it in my games because I don’t enjoy discussing (i.e. arguing) philosophy with the vast majority of my players — partly for the reason you mentioned above, that comparing alignments to philosophies doesn’t work. I’ve studied just enough philosophy that I hate arguing with people who — A) haven’t also studied philosophy, and B) don’t know how to argue properly. And then there’s the ridiculous movement in video games to include “moral choice systems” that always, ALWAYS favor one disproportionately to the other — usually playing a good character is more challenging and results in the more satisfying story, whereas playing an evil character almost always results in the same boring, puppy-kicking, baby-eating shenanigans. …But I still like alignment, and that’s led me to try and develop a system of alignment that’s gameable without leading arguments. The system I’m developing is coupled with a setting inspired by mythical Greece, and works on a Destiny/Agency axis. Agency is represented by every choice the player makes on behalf of their character, while Destiny is represented by every roll of the dice. Because every creature or character is a combination of both, choosing Destiny over Agency or vice versa is an arbitrary (and still vague) decision — with a tremendous impact on the character’s actions and viewpoint. Plus, it can have a mechanical impact without explicitly favoring one side or the other. I have yet to implement and test it, but I have high hopes. Interesting idea Dither, but wouldn’t be choosing Destiny over Agency automatically be an act of Agency, since it involves making a choice? I’m not a big fan of gameable morality systems probably in no small part because of my work in ethics. The nature of any worthwhile ethical system ought to be such that it isn’t gameable, because what matters about ethics is being good, not scoring points. That’s why so many videogames have a hard time with it, I think. It’s hard to say my Shepherd is a good person when I’m trying to gain some player payout and being consistently rewarded for it. What breaks if the player is playing in a way that differs from their alignment? As far as I can see, nothing, which makes me wonder why it would ever be necessary or beneficial for the DM to change a character’s alignment, or to suggest a change. I don’t use alignment, but if I did, it would be like skin color: it has certain mechanical interactions with the world and is not easily changed, but it is entirely independent of one’s actual behavior BUT most people don’t believe that. Where alignment restrictions exist, it’s entirely due to a group’s preconceptions about alignment, along with, possibly some practical considerations (no good hiring a paladin who can’t hold a Holy Avenger or enter certain locations.) For devils and angels, those preconceptions just happen to be 100% true. For everyone else, they can decide to adhere to the stereotypes or not. I enjoy that there are some semi-meaningless effects in games like D&D. It makes you vulnerable to some spells but not others. Throwing around words like “Good” and “Evil” tend to have a strong effect on players, too. Really, alignment is a convenient way of summing up their character’s stated ideology. It says “These are some of the things my character stands for.” When I have the chat and invite a change, it’s because the character’s behaviour isn’t consistent with the principles they put forward. I find it’s a good way to check in with people, especially since I work with a lot of new players. The result of the conversation depends entirely on the story they want to tell with their character. I suppose my best answer is “their expectations”. A lot of the time the reason I wind up talking with players is because they’re uncomfortable with the way their character is turning it in game and aren’t sure what to do about it. It’s one of the consequences of playing with a lot of new players, I think. I’d also use alignment as an Aspect in a Fate game because then if I want it to be meaningful at all I would have to play to and spend points on it, or suffer compels on it (which would earn me points). That is a really good idea. I’ve never tried it, but I think I might in my next one, because it’d have an incredible in-game effect, so long as the GM and the player had the same understanding of what the aspect meant (which is necessary for any aspect anyway, so it isn’t really a hurdle). The game allows for a little slow in the understanding. If the GM just goes along with every use of the Aspect, the player will burn through their Fate points, at which point the player will consider how their aspects, including the alignment one, can act to compel them, and give them more points. In a sense, every aspect is a form of alignment. Hey there would you mind letting me know which webhost you’re using? I’ve loaded your blog in 3 completely different browsers and I must say this blog loads a lot faster then most. Can you recommend a good web hosting provider at a honest price? Thanks a lot, I appreciate it!